I firmly believe in experiential learning in context. 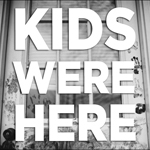 I think the cuts to field trips we’ve seen in recent years in response to reduced funding for programming beyond school walls and preparation for standardized tests is one of the most under-discussed problems with public schools today. I’m working on an article on the value of field trips, for educators as well as their students, and exploring the subject with my students. 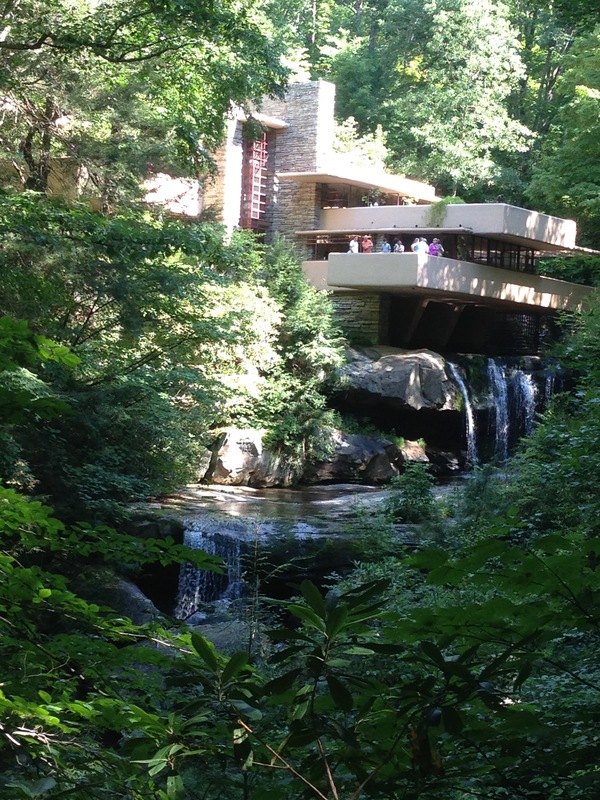 This weekend, as a means of breaking up a long journey across Pennsylvania (seriously, if you’ve driven it you know what I mean), Cora and I went on what might be considered the penultimate art field trip when we visited Frank Lloyd Wright’s Fallingwater. We joined the Saturday morning children’s tour (ages 5-8) and set out from the visitor’s center promptly at 9:30am. There was only one other boy and his father in our group, so it was intimate and Cora got to converse a fair amount with our docent, Susan. As we walked down the path, Susan asked the children to start looking in the bushes and rocks for natural homes animals might live in. We stood under the boughs of a giant rhododendron, near its trunk and at the edge of its canopy, imaging where we would stay driest in a rain storm. 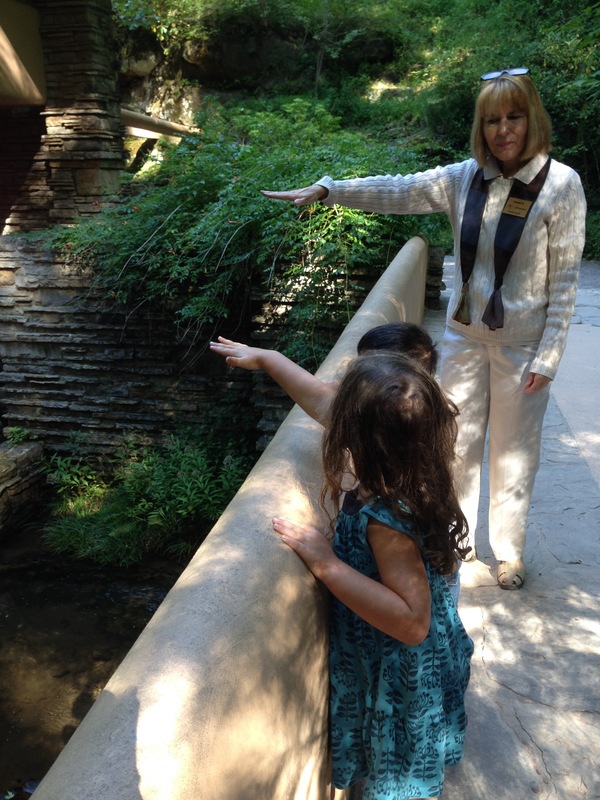 We looked for covered crevices in the ravine walls of Bear Run and Susan told us that Frank Lloyd Wright studied animals and their shelters to see what he could do with rock. She asked each of the children about where they live. “Do you live in the city, suburbs, or country? 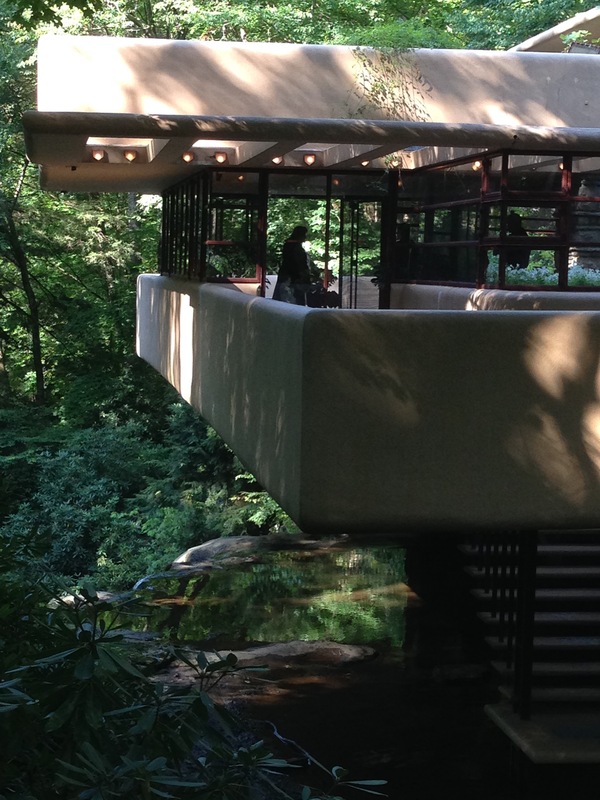 When you get home, I want you to compare your house to the one we’re about to see.” In retrospect, this suggestion reminds me of something I read about Fallingwater before we visited, that it will change how you see the world. I’ve seen a lot of Wright’s work in my lifetime but this was, hands down, the most thought-provoking and awe-some. I’m left wondering, what happens when you see that at five? “Use your imagination. This blue piece of cloth is the creek…. Susan showed the children some photos of and told them stories about the Kaufmanns, the Pittsburgh family who commissioned the house. One of the photos depicted the rustic cabin they had on the land prior to Fallingwater. It would be an understatement to say the contrast was like night and day. Finally, we got to go inside! No photos were allowed. On the one side it felt like torture not to be able to take photos of something so amazing, but on the other, the tour moved through the spaces quickly it really was better to spend the time looking directly than through a lens. That is a rare thing these days. As we paused to look around the main living room, Susan told the kids,”A lot about this house makes you wonder if you are inside or outside. As we walk around, see if you can spot the outside coming inside.” Cora embraced this challenge. 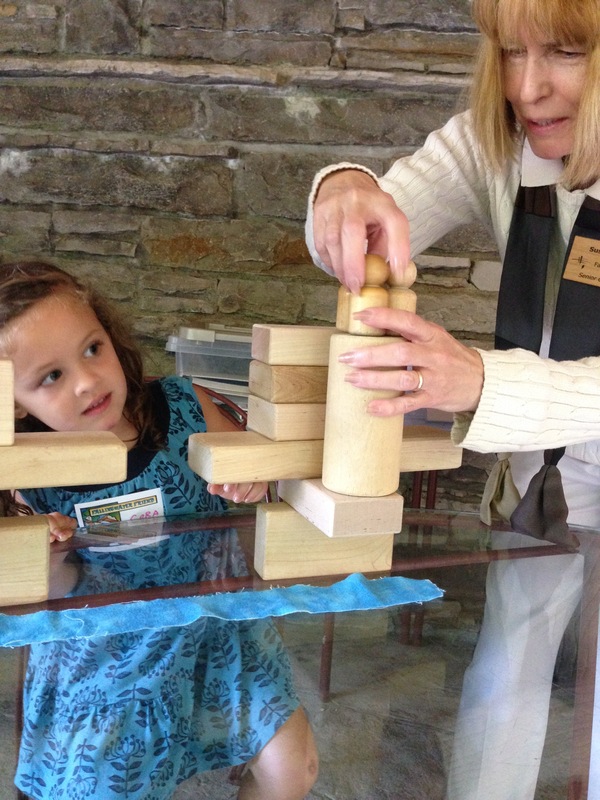 She found large stones embedded in the floors and walls and immediately understood when Susan demonstrated how the windows could be used to control the volume of the waterfall based on how wide they were opened. I have to admit, it gave me a lot of pleasure to watch her actively soaking it all in.